Work Hard, Play Fair and Be Nice! Jacquelyn "Jackie" Kile, the Student of the Month from Venture High School was introduced by Adam Fehling. Jackie wants to study veterinary medicine after high school. JT Taylor gave us an overview of the District 1 Juvenile Detention Center and the programs they provide to help youth in custody. Rich Christensen encouraged us to read the Rotarian Magazine article "Putting Civility Back Into Civil Discourse" and we all enjoyed a yummy breakfast buffet at the Hagadone Event Center. At our meeting this morning we heard about a great organization in our area called Relatives as Parents. This is a 501(c)(3) non-profit that exists to strengthen the safety net resources and support for Idaho children being raised by a relative. Special guests included two of the Lakes students who went on the Schweitzer ski adventure this year. Our Sunrise Flower Princess, Jaime Arnold, received a cap decorated with posies from Mark Beardsley. Mark Beardsley took photos at our Sunrise Social at Seasons on Tuesday night. These are just a few of the attendees. Ada and Laura were trying to pitch a nickel into a glass and Ada was victorious! It was a fun morning with lots of stories and happy dollars from our members. Jimmy McAndrew received his Paul Harris Fellowship certificate and pin. Math teacher, Darren Gabrielson (aka Mr. G) introduced our April Student of the Month from Coeur d'Alene Charter Academy, Marissa Samayoa, a gifted student who shares her time and talent by tutoring other students. Marissa plans to attend the University of Idaho to study Computer Science. Such a great program today from Tony Blasick, a Kootenai County EMT who is part of a local medical training team that provides free classes in pre-hospital trauma care for medical personnel in Bolivia. Working with “Mano A Mano,” Tony and his family are raising money to build a 6 classroom school, bathrooms and teacher housing for a small rural community. Big thanks to Eric Komberec for our program on "Miss Montana to Normandy," a vintage C-47 aircraft that will fly in the D-Day Squadron from England to Normandy on June 6th. The plane will drop paratroopers in vintage gear for the 75th anniversary reenactment of D-Day. After the Normandy trip the plane will travel to Germany for the anniversary of the Berlin Air Lift. We also honored Marisa Hagerty as the Student of the Month from the Coeur d'Alene Charter Academy. Marisa will graduate from Charter and NIC in May. She was introduced by Dr. Bill Proser. Today we heard from historian and author, Jack Nisbet, about his latest book The Dreamer and the Doctor, documenting the lives of John and Carrie Leiberg who arrived in the Idaho Territory in 1885. We also honored our Student of the Month from Venture High School, Kayla Arndt-Lane. She was introduced by her teacher and mentor, Val Martin. Today we recognized Isaah Ove as our Student of the Month from Venture High School. Isaah plans to enlist in the Marines after graduation, then become a firefighter after his military service. He was introduced by his math teacher, Kevin Mahoney. 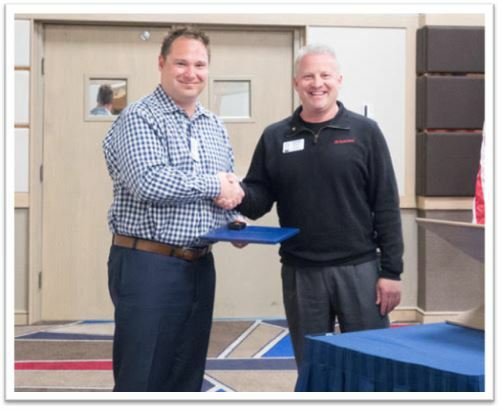 Today we welcomed Gavin Mobraten from US Bank as a new member. We also welcomed back a former charter member, Rich Nyquist. 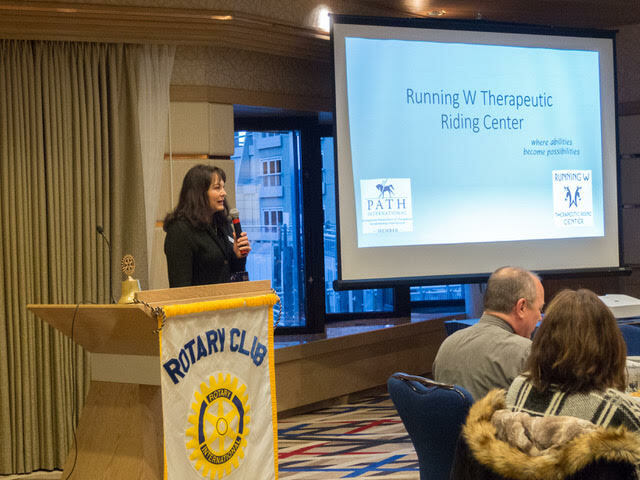 Our program today was presented by Cyndie Wiltsie from Running W Therapeutic Riding Center. They provide therapeutic riding lessons and equine experiences for special needs kids, seniors and veterans. 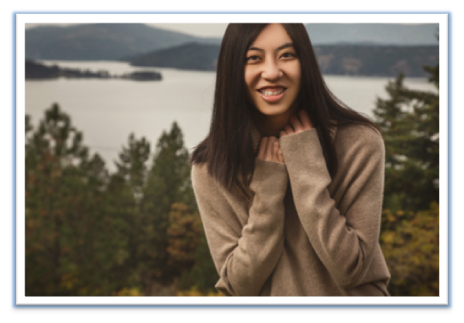 Today we honored our January Student of the Month from the Coeur d'Alene Charter Academy, Kaitlin Le. She told us about the sometimes lonely process of acclimating to a new school. At Charter, she found her voice and developed confidence with encouragement from her Spanish and Debate teachers. To support other new students, she established a new WEB Club on campus - Where Everyone Belongs. Congratulations, Kaitlin. As we say goodbye to 2018, let's give thanks for our many blessings and welcome the new year with all of the opportunities it will bring. 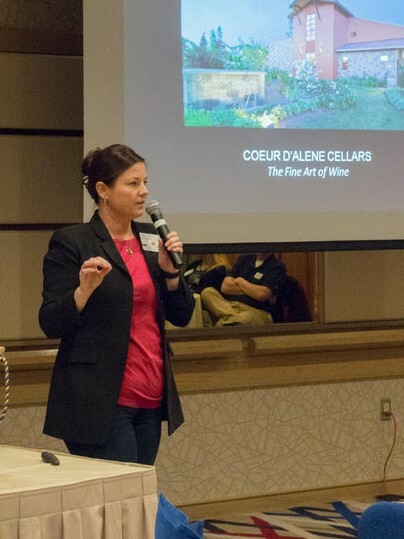 Joanna Adams took us on a wonderful journey as she shared beautiful photos from the 2018 Coeur d'Alene Cellars European Wine Tour. 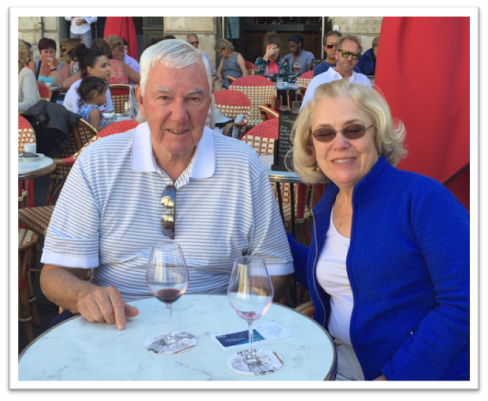 Their group traveled to England, France, Spain and Portugal with stops in many fascinating and historic areas. 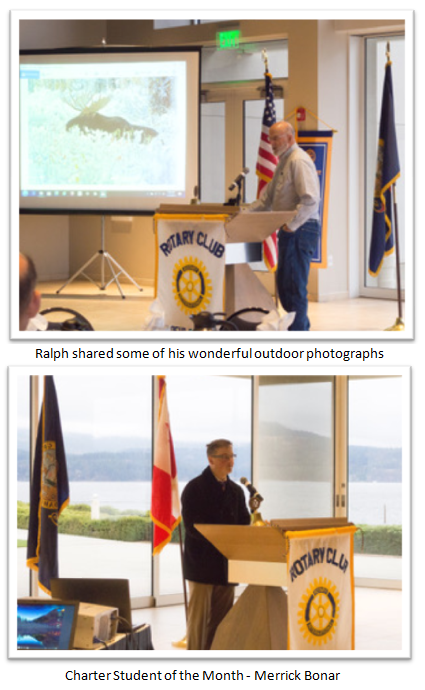 Visiting Rotarians, Charlie Gates and Kimber Gates-Travis joined us for the presentation. Great program! We honored our December Student of the Month from Venture High School, Christa Gladden. She is an amazing young woman and mother. Her story was inspiring and we were touched by her determination to succeed. Her adorable daughter, Michelle, and her proud parents Cody & Jodi Likel were her guests, along with Susan Thomas from Venture. We also honored Paula Pinkerton as our newest Paul Harris Fellow and the December Student of the Month from the Coeur d'Alene Charter Academy, Sequoia Wheelan. We also honored our November Student of the Month from Venture HS, Kayla McKinnon (holding the mike), and Kristi tried in vain to pick the joker for the 50/50 jackpot. Today we enjoyed hearing from Dr. Steve Cook, SD271 Superintendent. We learned about some of his top goals including engaging with the community, building a new elementary school, increasing mental health services and school security. 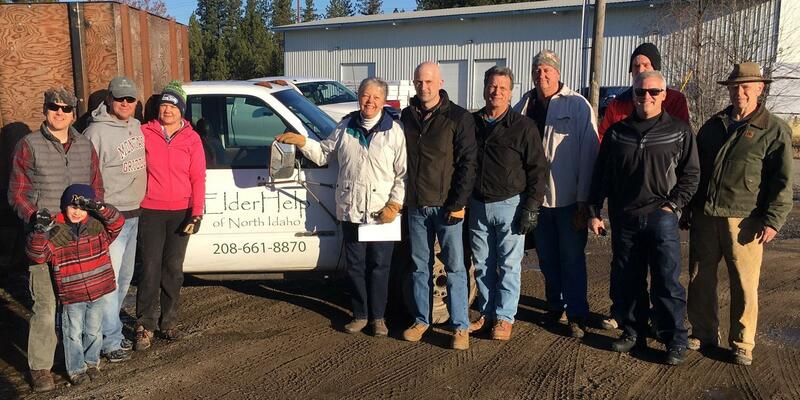 Great day to volunteer with ElderHelp - Josh Sattler & son, Brian & Ada Loper, Karen Cook, Scott Jones, Chris Guggemos, Bryan Taylor, Steve Speer (back), Brian Goetz and Mike Beck. 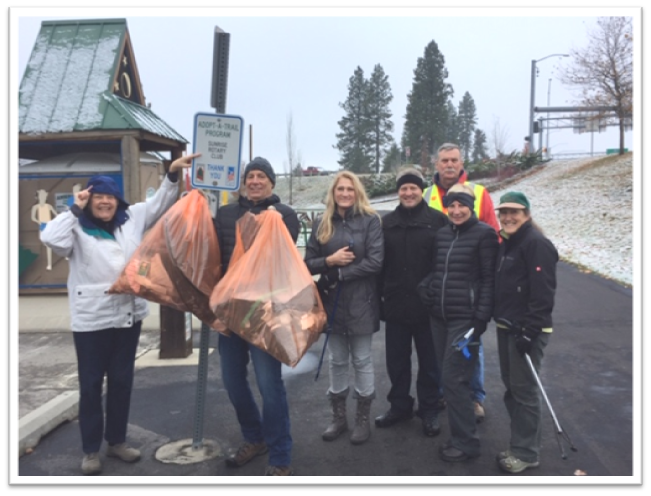 Big thanks to the 11 hearty Sunrise Rotarians who braved the cold to pick up trash this morning. President Brian brought coffee and donuts to keep us warm and energized. Karen, Kim, Sari, Brian, Steve, Judy, and Mary were some of the work crew. Not pictured - Ada (taking the photo), Jen and her son, Teresa and Bryan. Troy made sure we had trash bags and safety vests! Great meeting at the Hagadone Event Center this morning. 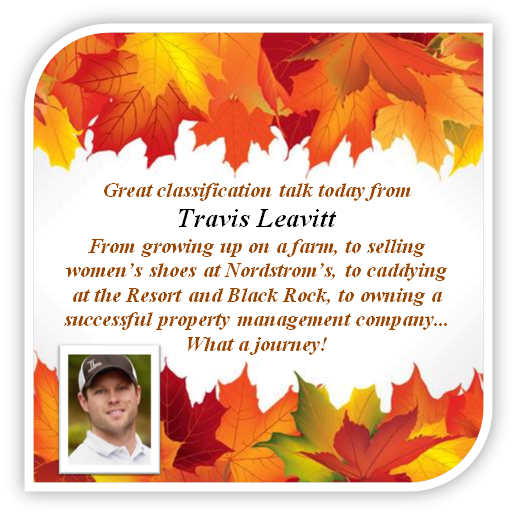 Our meeting on November 6th will be at the Hagadone Event Center at the Resort Golf Course. 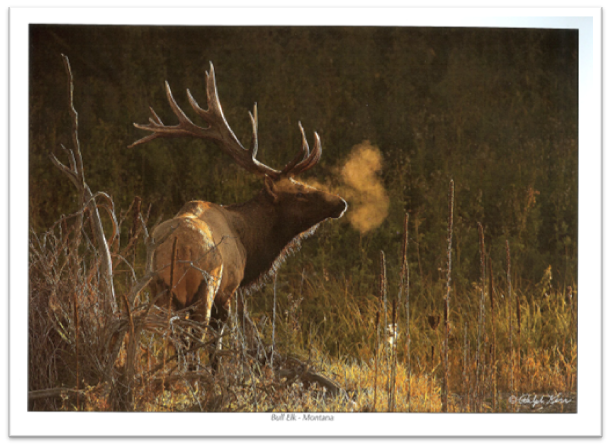 Ralph will share some of his wonderful photos and we will kick off Foundation Month with a video that explains the Annual Fund, the Permanent Fund (Endowment), and the PolioPlus Fund. Good basic information on our Foundation. Join us at 7am Pacific Standard Time! Ralph's 2019 calendar is fabulous ($16)! 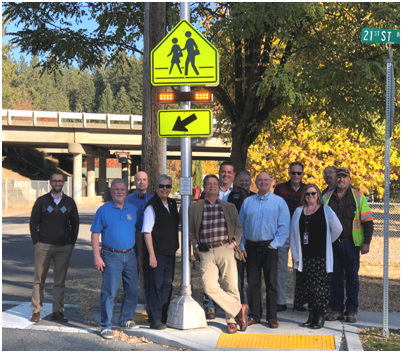 Yesterday we dedicated the new crosswalk beacons on Pennsylvania at 21st near Fernan STEM Academy. Rotarians from the three partner clubs joined with Todd Fussier, Robert Royce and Sue Sims from the City and Fernan Principal Kathy Livingston for the celebration. Kathy thanked Rotarians for the beacons, for helping at the school's fall celebration, and for serving as volunteer crossing guards. World Polio Day is October 24th. 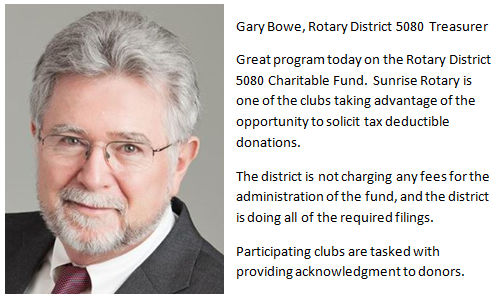 Join Sunrise Rotarians at our meeting on the 23rd for an update on the worldwide polio eradication effort. Every dollar donated to PolioPlus is matched with $2 from the Bill & Melinda Gates Foundation. 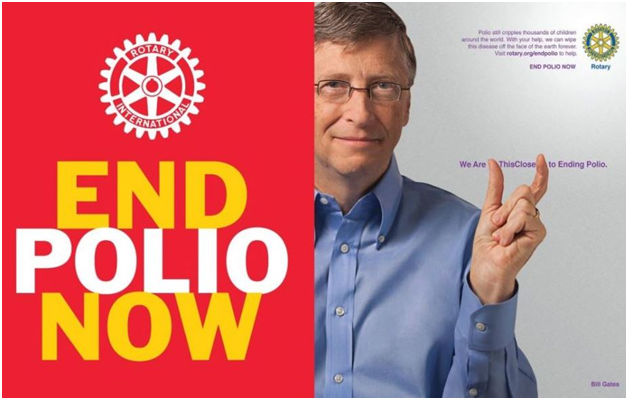 We are this close to ending Polio! 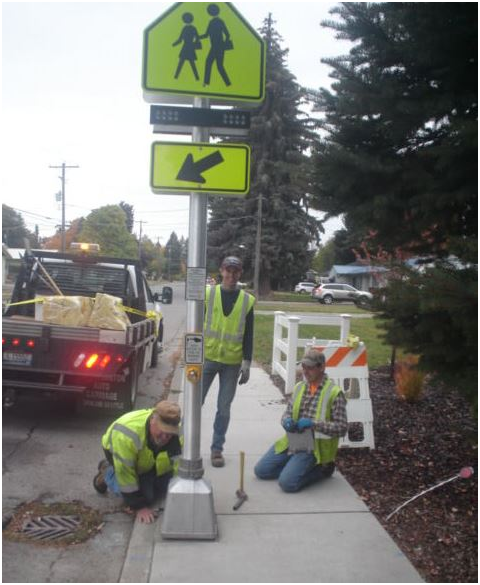 The crosswalk beacons were installed this morning! This will improve safety for students and pedestrians crossing Pennsylvania at 21st near Fernan STEM Academy. A dedication ceremony is in the works for mid-month. We will keep you posted! 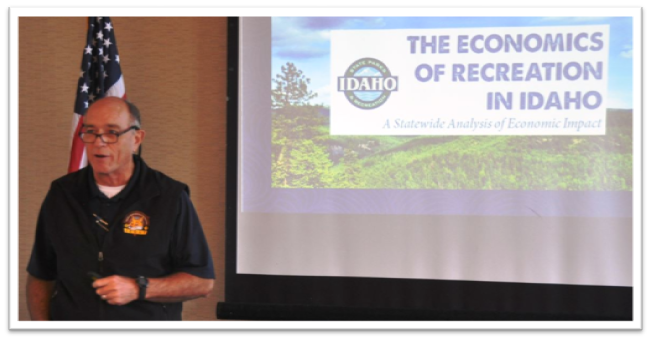 Great presentation from David E. White, North Idaho Region Parks Manager, on the economic impact of recreation in Idaho. Great program today from Ned Morris, a Shelter Box USA first responder. Ned is a member of the Walla Walla club and has been deployed three times, twice to Africa and once to the Caribbean. 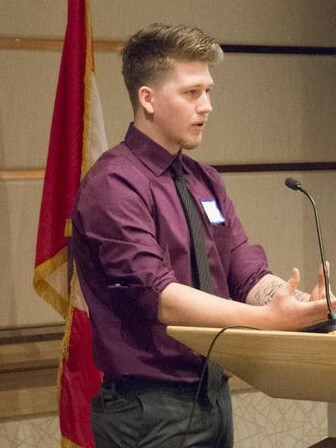 He trained for a year to become a first responder and has enjoyed being part of the Shelter Box team and partnering with Rotary and the United Nations to serve impacted communities. www.shelterboxusa.org Ned is looking for interested Rotarians to become Shelter Box Ambassadors. So much fun having our former French exchange student, Charlotte Gardes, at Rotary this morning. 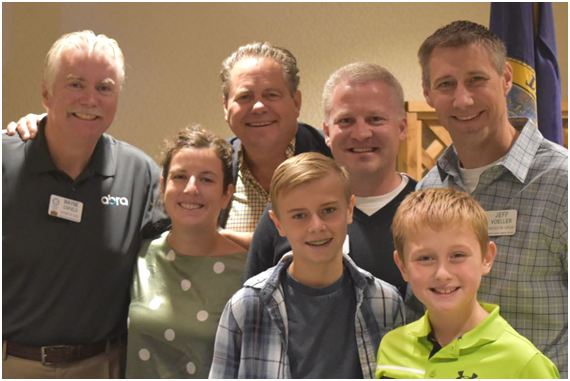 Charlotte had her picture taken with ski buddy Wayne Cofield, host Dad Mark Fisher, club president Brian Goetz, special friends Jeff Voeller and his sons Jaron & Jace. Charlotte and her boyfriend Youri are here for a 10-day visit! 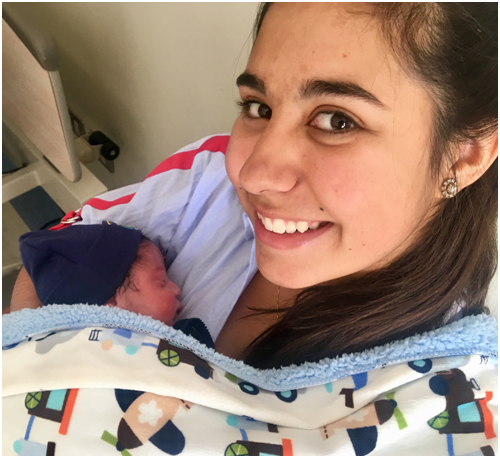 Carolina Jara, our former exchange student from Chile, sent this photo with her new baby brother, Diego. Carolina will be a wonderful big sister! 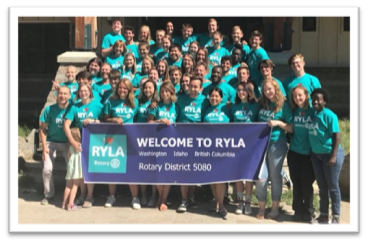 Today we enjoyed a presentation from Paul Connelly on his 2018 RYLA experience. RYLA gives campers the opportunity to learn and grow, developing self awareness, awareness of others, and honing leadership skills. Paul told us the days were long but he enjoyed the variety of sessions, activities and hugs. A few of his favorite sessions were on ethics, business meetings, leadership and as a bonus he learned about nutrition and the benefits of eating better. Thanks for a great program, Paul! Great day at Sunrise Rotary. Luke Russell, Hecla Vice President - External Affairs, gave a fascinating update on technology and equipment used by Hecla Mining Company to improve productivity and safety while saving energy. Thanks, Luke! Beautiful day at the Habitat house. 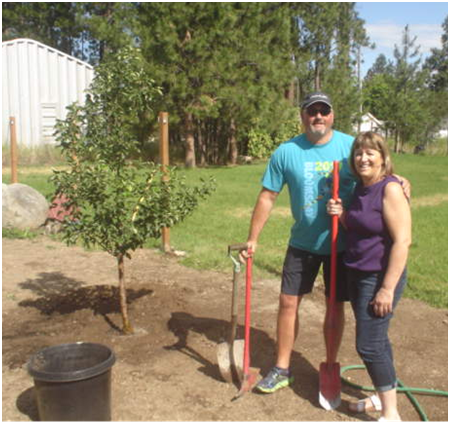 Homeowner, Nathan, had requested an apple tree for his backyard and it was planted today. Dwight and Teresa did most of the work with Karen taking pictures. Lots going on at the house today with Habitat volunteers building a fence and a shed. Dwight and Teresa with the new Granny Smith Apple Tree! 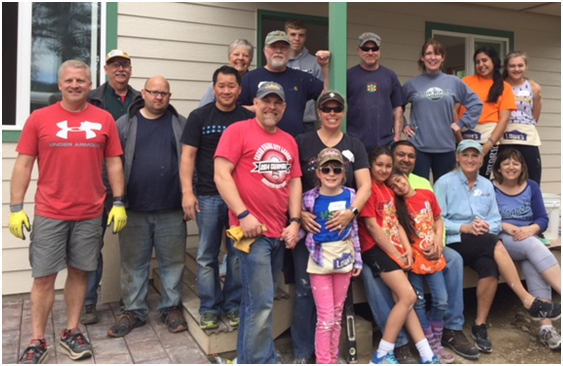 On May 19th, Sunrise Rotarians with family members and friends reported for work at the Habitat house in Post Falls. Our assignments were to paint the interior of the house and lay pavers between the front steps and the garage. We had a great time working together and meeting the homeowner, Nathan (pictured between Brian and Gary). 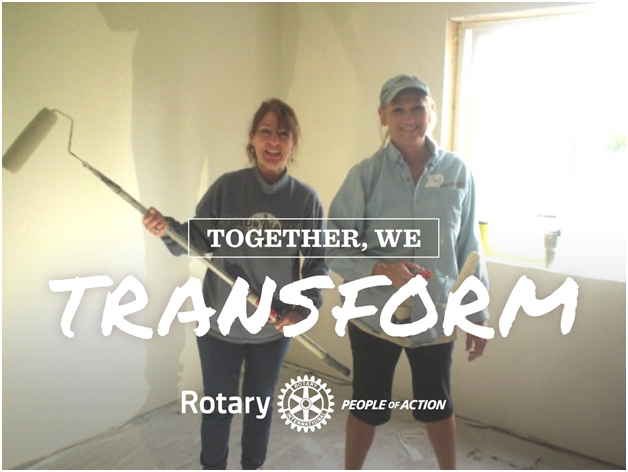 What a great caption for this photo of two of the painting crew, LaDonna & Sari. 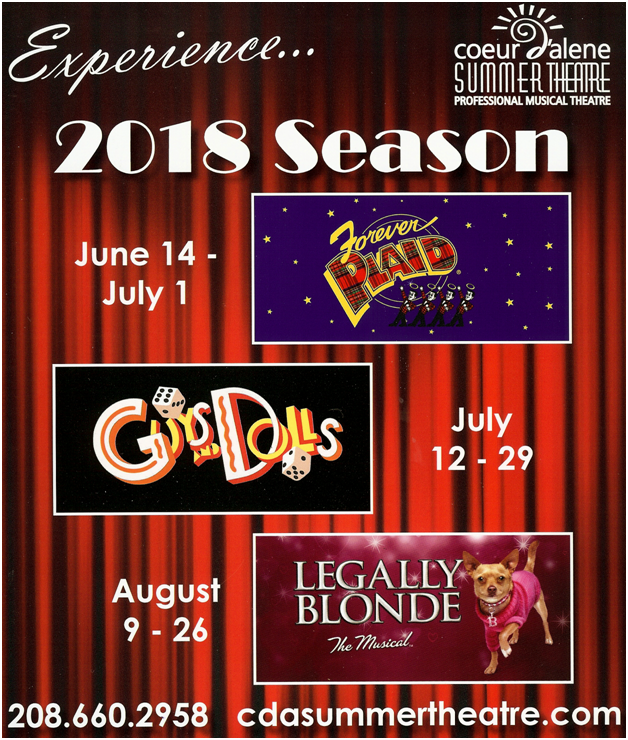 Great program from Kerri Thoreson, Executive Director of Coeur d'Alene Summer Theatre. We also honored the Student of the Month from the Charter Academy, Matthew Streeter. Our program was presented by Ali Shute from the Arts & Culture Alliance. We learned about the 8 programs they sponsor annually and Ali thanked us for supporting the "Music for the Wise" program that hires talented musicians to play for residents in nursing homes. Four CDA Charter Academy students received $500 Scholarships...and we had many guests! CDA Arts & Culture Alliance Executive Director Ali Shute brought us an update on the "State of the Arts" in Coeur d'Alene. CDA Charter Academy students pick up scholarships. L-R; Mia Maldonado, Marie Michalson, Clara Marie Zaragoza. Not Pictured: Ana Segsworth​​​​​​​. 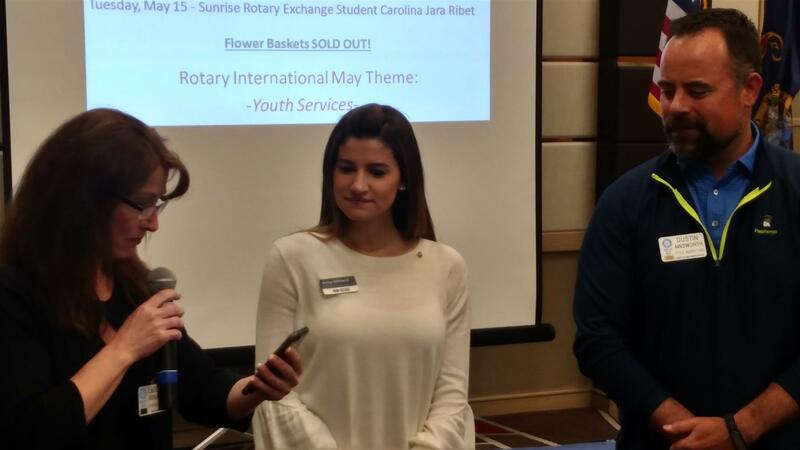 The program was presented by Carolina Jara, our Rotary Exchange Student from Chile. She gave a great overview of her country and home town, Santiago (population 6 million). She told us about the economy, native animals, food, and landscape. She reminded us that the seasons are opposite of ours so Christmas is in the summer. Lakes Middle Schoolers showed a short video with highlights from their ski trip to Schweitzer. We also awarded $1500 NIC scholarships to Desireya Quintero & Brook Garnett of Venture High. A very busy morning! Area 6 clubs met at the Hagadone Event Center for an All Club Meeting. 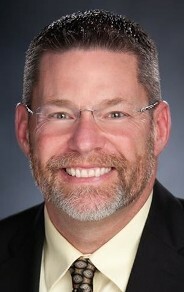 The program speaker was Jay Larsen of the Idaho Technology Council. Each club's President updated the group...LaDonna spoke for us! Our program was presented by Rebecca Stevens from the Coeur d'Alene Tribe. She shared history and an update on the Coeur d'Alene Basin Restoration and said the restoration plan is ready for signing by the Secretary of the Interior. Not sure if/when he might sign it. The plan partners have followed all of the appropriate steps to approval and are hopeful it will be signed soon. We welcomed new member Jenna Gilliland, sponsored by Dustin, and Charter Student of the Month Grace Moehring (along with her mom Kim). Plus a Paul Harris pinning for Kristi Hagan, Club awards presented to Past President Bryan Taylor and welcoming new member Doug Thomas. Our program was presented by Dr. 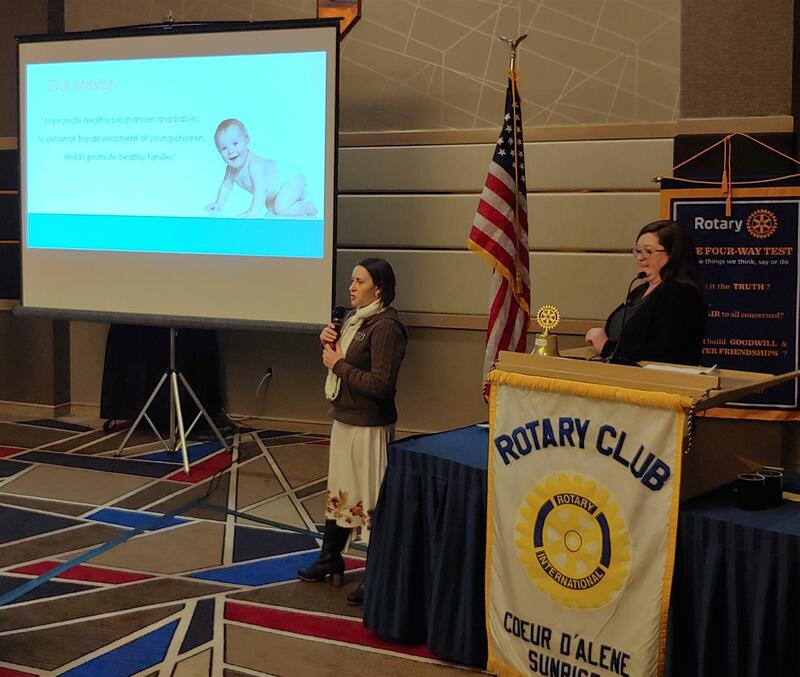 Crystal Pyrak and Lynne Clark from the Kootenai Health Emerge Program - providing outpatient centered obstetrics and neonatal care for women struggling with addiction. 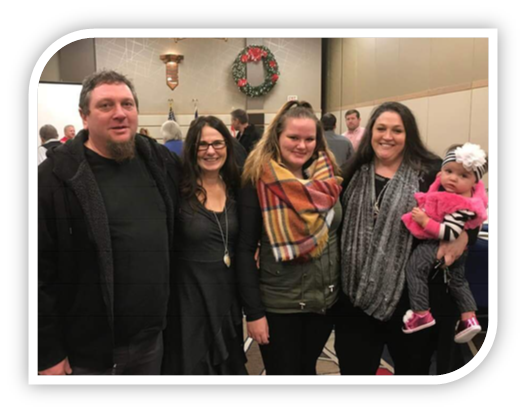 Our club recently donated $500 to support Emerge program participants as they work their way toward healthy outcomes for themselves and their babies. We also honored Venture High School Student of the Quarter Desi Quintero. Next week: Scotchman Peak Wilderness. Dr. Crystal Pyrak explains the EMERGE program. Venture High counselor Matt Flieger introduces Student of the Quarter Desi Quintero. 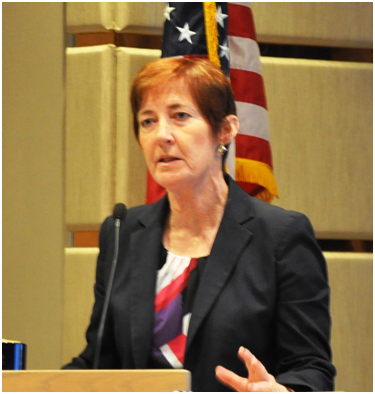 US Magistrate Judge Candy Dale gave us an overview of the federal judicial system in Idaho and told us about the types of civil, criminal and mediation cases that come before the magistrate court. Judge Dale said one of her favorite duties is presiding at US naturalization ceremonies. 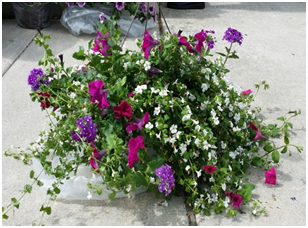 Sunrise Rotary is selling beautiful hanging flower baskets in 12" pots for $40 each. Delivery will be on May 8th, just in time for Mother's Day. The baskets are made up of a variety of trailing flowers in complementary colors. We are not able to honor requests for specific color combinations but you will be delighted with the size and beauty of these spring classics! Visit our club on Tuesday morning at 7am at the Coeur d'Alene Resort to place an order or call 208-667-6300.